The RFID Asset Tracking Solution includes all of the components necessary to track the assets important to you. A long range read of assets is an advantage to the already robust capabilities of the ABC Scan Asset Tracking Program. This solution includes a Motorola MC9090R Mobile device and the software to track your assets. 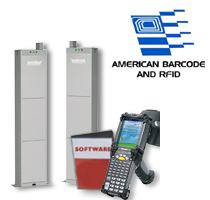 Stand-alone Radio Frequency Identification (RFID) Software enables the reading and reporting capabilities of encoded components, packages, pallets and assets. RFID Portal is a compact, packaged radio frequency identification (RFID) portal system designed to enable the rapid deployment of proven and reliable RFID technology at your dock doors and doorways. It lets you capture bulk data from a large number of tagged items as they quickly pass by. You will be able to track RFID-tagged assets, products and cargo as they enter and leave your facilities and storage areas and move throughout your supply chain. Give your workers the ability to capture a comprehensive range of data. Capture data from RFID tags and bar codes to images with this flexible multi-function device. Single device simplicity translates into simpler and cost-effective mobility architecture with fewer devices to purchase, support, and manage. Whether your workers are on the manufacturing floor, in the warehouse, on the loading dock or out in the yard, the rugged design ensures reliable performance.